Next generation of skateboarders, like Abuga Aroni, upload their daredevilish videos on Instagram. There are also a number of longboarders in Nairobi. They tussle with the cars and motorcycles, speeding down Nairobi's steep hills. 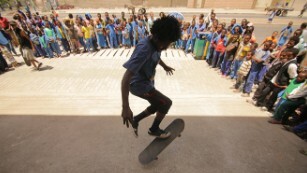 Skateboarding also provides a much-needed escape and focus for some of Nairobi's disadvantaged youth. Skateboarding kicked off in west-coast America around the 1960s. Thrill-seekers would drop in on empty pools and sidewalks. While the trend swept parts of Europe, North and South America and Asia about four decades ago, it took longer to get to places like Nairobi, Kenya. Until the last 10 years or so Nairobi’s urban infrastructure — featuring potholes, bumpy roads and few sidewalks — wasn’t exactly a smooth ride. Skateboarding arrived in Kenya about a decade ago, galvanized by the spread of skateboarding videos online. Skate videos have long been central to the scene worldwide. Platforms like Thrasher Magazinehave over four million followers on Instagram, showing clips of skateboarders landing and crashing — setting a standard for aspirant skaters. “There are some people who like skating in the streets, purely in the streets,” said Zuko. The number of skateboarders is still small, but it’s a tight-knit community. Skateboarding also provides a much-needed escape and focus for some of Nairobi’s disadvantaged youth. Some have spent time on the streets, like Ezra, 12, who’s a rising skateboarding star, and has been given a home by fellow skateboarder Zuko. The Shangilia Skate Park, the biggest one this side of the continent, was opened in 2013 and is now a hub for the city’s skate scene. The Kenyan skateboarding community, with the help of NGO Skate Aid, made the project a reality after many months of hard work and labor, and many tons of concrete.